STEAMBOAT SPRINGS, CO-February 8, 2011-Steamboat’s 2010/2011 season cumulative snowfall nosed past the 300-inch mark at mid-mountain this morning due to a storm that has blanketed the resort with 14 inches of fresh Champagne Powder® snow overnight. Steamboat is in a storm cycle that as of 5am yielded 14 inches at mid-mountain and 16 inches at the summit in the past 24-hours; 20 inches at mid-mountain and 22 at the summit in the past 48-hours; and 37 inches at mid-mountain and 44 inches at the summit in the past four days. 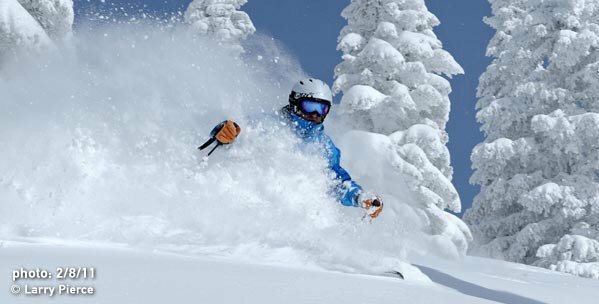 The resort is reporting a whopping 88-inch base at mid-mountain and 113-inch base at the summit on powder conditions. This season, snow has surpassed the third row of fence wires across the Yampa Valley. As Sureva Towler writes in her book, The History of Skiing at Steamboat Springs, “By January or February of a typical winter, snow will cover the third fence wire, usually 30 inches high.” Four-wire winters, generally more than 350 inches at the resort’s mid-mountain location, were recorded in 1983/84, 1989/90, 1992/93, 1995/96, 1996/97, 1999/2000, 2005/06, 2007/08 and 2008/09. Ready to reserve that Steamboat Ski or Ride vacation you have been dreaming about? The Steamboat Travel Specialists at Tours de Sport are standing by and are ready to help you plan that perfect holiday.